E-Crane, the only Belgian manufacturer of port cranes with subsidiary companies in the Netherlands (E-Crane International Europe) and Ohio, USA (E-Crane International USA), keeps on expanding its market with a brand new 1500 series crane in Sweden for Mälarhamnar AB. This is another success on Scandinavian territory for the company in only two years’ time: in December 2010, the Port of Kokkola, located in mid-west Finland, officially put into service a 2000 series E-crane. The Swedish company Mälarhamnar AB has recently installed its second E-Crane in the port of Västeras, situated in the heart of Sweden’s industrial belt. This is the second machine for Mälarhamnar AB who commissioned a rail-mounted 1500 series back in 2003. 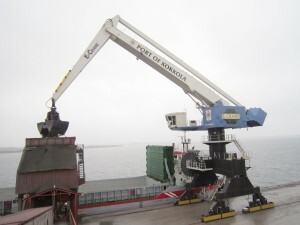 The brand new 1500 series E-Crane commissioned late in 2012 is being used to unload Handysize vessels. It can load and unload a large number of different bulk materials and break bulk as well as logs from vessels of up to 10,000dwt. 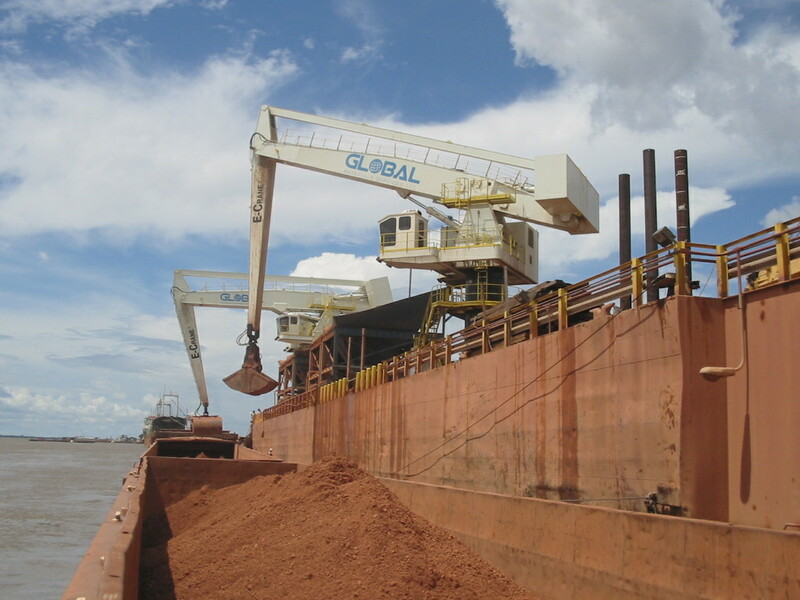 Bulk materials handled include peat, coal, peat, and scrap. 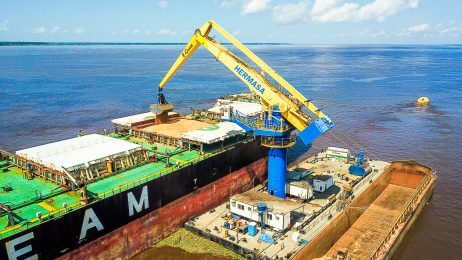 The new Equilibrium crane has an outreach of 104ft (31.7m), and a lifting capacity of 17.1 US tons (15.5 metric tonnes). Mounted on a rail-bound gantry, the crane is electrically E-Crane’s growing success in the Scandinavian market powered. Benefits of this setup include smooth crane movement and high operator comfort. The Port of Kokkola purchased a rail mounted 2000 Series E-Crane, model 17359 GA-E for unloading iron ore, zinc concentrate, and coal. The crane has a maximum outreach of 35 metres (117ft) and a duty cycle capacity of 21 metric tonnes (23.1 US tons). E-Crane was chosen by the port due to its high transloading capacity and precise operation. The balanced E-Crane can reach capacities of up to 1,300tph (metric tonnes per hour) and can be operated easily, with utmost precision. The E-Crane at Port of Kokkola successfully loads and unloads iron ore oxide into large handy-class sized vessels (shore-to-ship operation). 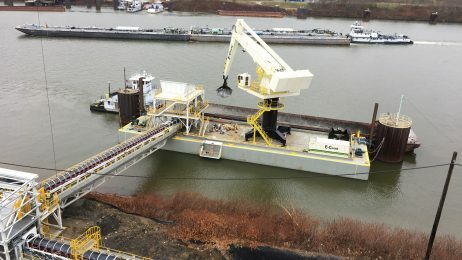 More demanding jobs are no problem either; the E-Crane also offloads zinc concentrate from coasters into an existing travelling hopper, located on the side of the dock (ship-to-shore operation). It also obtains fast cycle times of 40 seconds per cycle. Utilizing the E-Crane, equipped with a 7.5m3 hydraulic clamshell bucket grab, results in a net payload between 14 and 16 metric tonnes, and peak offloading capacities in the 1,150 to 1,300tph range (zinc concentrate). The E-Crane is a truly unique and revolutionary machine with the lowest power consumption cost in the industry. The E-Crane runs on clean electric energy, saving customers large amounts of money when compared with diesel powered equipment. E-Cranes also have very little associated maintenance costs due to E-Crane’s innate design. The key to the E-Cranes’ efficiency is the parallelogram design linking the stick to the moving counterweight. This unique four-bar mechanism ensures that the E-Crane remains in near-perfect balance throughout its working range. 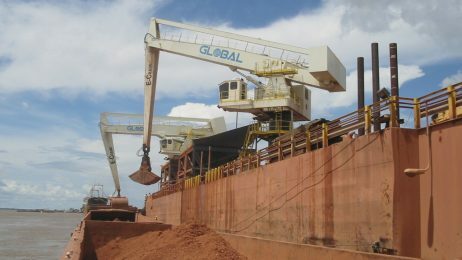 Compared with conventional cranes that require as much as 80% of their available energy just to move the boom, stick, and grab, the E-Crane allows gravity to work for you instead of against you, reducing horsepower requirements and power consumption by up to 50%, reducing maintenance and operating costs. E-Crane Worldwide can supply the E-Crane® in five model ranges, the size of which is based on the maximum jib length and lifting capacity. 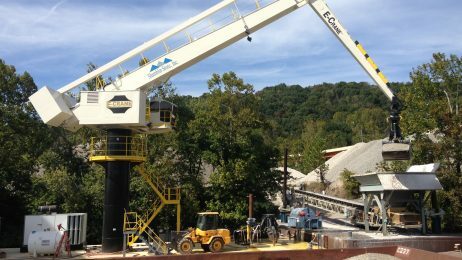 Each E-Crane and auxiliary equipment/systems are custom engineered for the customer’s specific application type, production goals and profit potentials. Successful End to a Busy Season!